After college LeeAnne worked in several job fields. Among other jobs LeeAnne worked as the personal assistant to a Hollywood star, a project analyst for a processed piping company and Training Coordinator for Sun Microsystems in the East Bay of the San Francisco Bay Area. She was well liked and respected no matter where she worked. There was something unusual about her. Contrary to the attitudes of many in the business world around her where customer service was a “buzz phrase”, something to say but not necessarily mean, LeeAnne’s upbringing established the importance of an attitude that quality customer service is more than a saying, it is the way business is done. This belief along with paying attention to detail, a sense of providing the services required of her position to the highest standards professionalism possible and truly caring about those who depended upon the services she provided, she promoted quickly from a temporary position in human resources to a full-time position. While she enjoyed her work, and derived a great deal of satisfaction from it, she gave it up for her family. LeeAnne left Sun micro to take on the challenge of being a stay at home mom. For many years she “ran the house” assuring that every detail was taken care of. LeeAnne, and her husband, raised 4 boys providing for their needs during the variable school schedules. Once the boy’s were in school for the entire day she had some time to do something else. 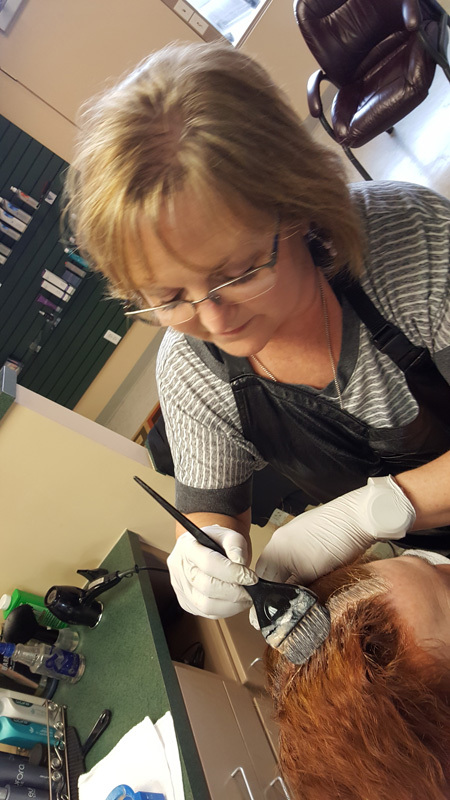 Looking to get out of the house while the boys were in school LeeAnne attended and graduated Salinas Beauty College in Salinas California earning the ability to test for California State licensure. LeeAnne passed the State licensure written and practical exams earning a California Cosmetology license in July of 2000. Having mastered Hair coloring, cutting and styling along with skin care and nail care. She practiced cosmetology in Hollister California providing hair care services, hair removal (waxing), manicure and pedicure for until 2012 when she moved with her husband and 3 of her sons to live in Lake Oswego Oregon. After passing the Oregon State board test earning her Hair Stylist license in Oregon LeeAnne began practicing as a Cosmetologist at Picasso Artistic Salon on “B” Avenue in Lake Oswego. To advance her business opportunities she “moved her chair” to B&B Hair Design in Portland Oregon, on SW Capital Hwy, near Multnomah Village. At B&B LeeAnne provides Barbering and hair styling services for the whole family. Along with many years of experience in hair cutting, styling and coloring services for clients, of all ages and needs, LeeAnne offers something else that is just as important as her ability to provide technically correct services: She cares about her clients. She strives to assure that from the consultation services prior to the cut, style and or color service, the actual services provided and the products available to maintain the look of the hairstyle and health of the hair, the quality must be the best available.